Donors over age 70 1/2 who are subject to Required Minimum Distributions (RMD) now have options that allow them to donate some or all of their RMD (up to $100,000 annually) directly to qualified charities. Distributions sent directly to qualified charities – such as Carolina Tiger Rescue – count toward your annual requirement, but are not taxable to either you or Carolina Tiger. There is no income tax deduction available, as the distribution (in most cases) is being made from assets that were never taxed. It is federal-income-tax neutral. Please note: under current North Carolina law, individuals aged 70 1/2 and older who make tax-free (for federal purposes) distributions to nonprofits from their IRAs must count these distributions as income on their state taxes, but can claim a tax deduction for the amount of the contribution [as of May, 2016]. 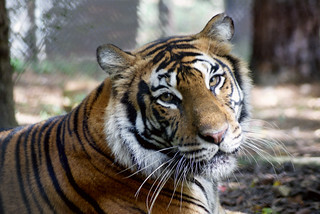 For more information about making a Charitable IRA Distribution gift to Carolina Tiger Rescue, please contact Heidi Zangara, Planned Giving Manager.